Community Partner Information Sessions are complete*. Next step: The Community Partner Interest Form! UPDATE 12.14.18: The deadline for submitting the Community Partner Interest Form has been extended! The new deadline for submitting the Community Partner Interest Form is 5 pm on January 11, 2019. Click here for more details. HealthierHere’s Community Partner Information Sessions were a huge success. In addition to presenting for multiple groups and coalitions between September and November of 2018, we held 2 webinars and 9 in-person sessions at 8 different locations across King County. 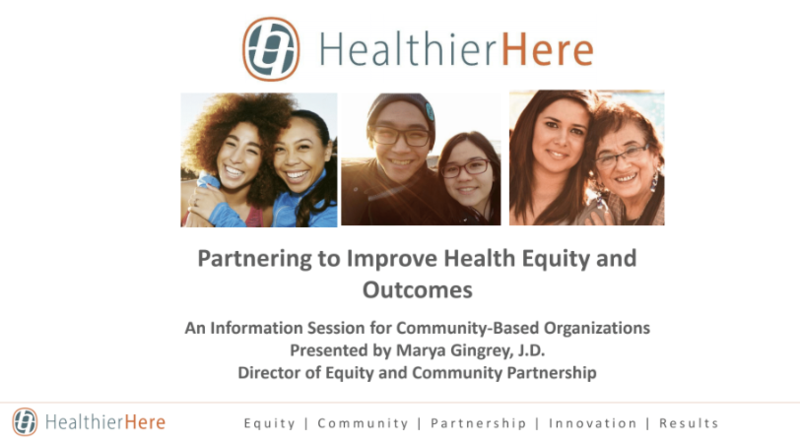 We met over 300 participants and connected with a wide variety of community-based organizations, social service agencies, community groups and coalitions actively working to improve health equity in our region. We have now concluded our Community Partner Information sessions for this phase of our Medicaid Transformation work and are inviting session attendees who are interested in becoming Community Partners to submit HealthierHere’s Community Partner Interest Form. The form is a quick, straightforward form that provides us with a little more information about the work that you do in community, who you reach and how that work might align with the work that we are doing at HealthierHere to advance health and health equity in our community. All attendees of the Community Partner Information Sessions will automatically receive an e-mail with a link to complete the form. The Community Partner Information Form is due by 5 p.m. on Monday, December 17th and must be submitted electronically if you wish to join HealthierHere as a Community Partner. Once the review of the Community Partner Interest Form is completed, we anticipate inviting those organizations whose mission align with our work to move to the next stage of the selection process which will occur early in 2019. *Please note: For those who were unable to attend a Community Partner Information session, we are offering a final chance to participate by completing the webinar by December 10th. By clicking here to complete the webinar by December 10th you will qualify to receive an invitation to submit the Community Partner Interest Form.